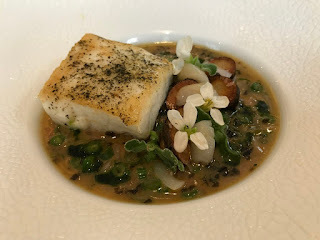 A food writer friend in Singapore suggested we have lunch at one of her favourite places, Whitegrass, which has just retained its Michelin one-star rating. It opened in 2016 and is run by executive chef-owner Sam Aisbett, who cooks modern Australian and uses Japanese ingredients in many of his dishes. The restaurant is located in Chijmes, the complex that used to be a Catholic school, so the space Whitegrass uses is a heritage one so it has an old soul, but also sophisticated feel to it, but not over-the-top. Outside there are tables to dine al fresco, but it's too hot for that and we went inside, sitting in the circular space at the back that fits about 28 people if completely full. 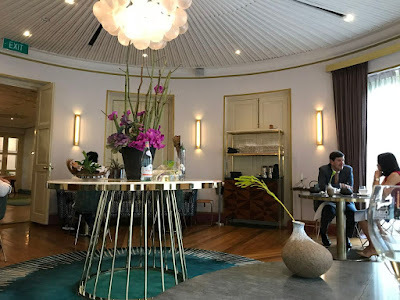 We looked at the three-course set lunch menu which looked like a good way to go, though there was an option for a five-course, and a tasting menu. To start an amuse bouche of ginger milk curd topped with delicious peas and seasoned with bottarga. It was so delicate and delicious, whetting the appetite for what was to come. My starter was sashimi yellowtail amberjack with Japanese land caviar, yuzu kosho and toasted seaweed oil. 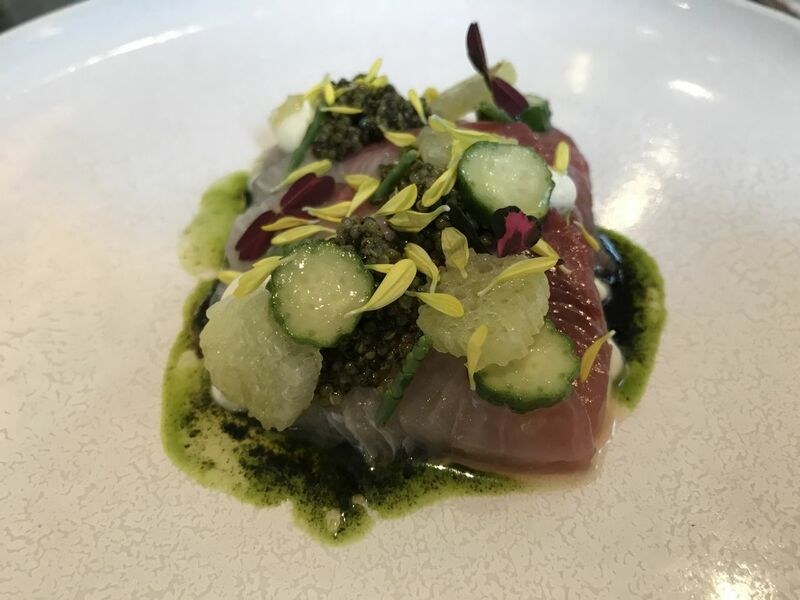 It was a taste of the sea in this dish, with the fresh yellowtail slices, mixed with small cucumbers and yuzu kosho, punctuated with bursts of caviar and seasoned with seaweed sauce. Meanwhile my friend had the slow roasted young beetroots with fresh goats cheese fetta, with crispy red quinoa, juniper and sour leaves. 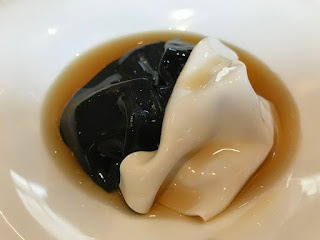 Next came an extra dish for us -- scallop yin yang that had one sheet white, the other black from squid ink made from scallops. Underneath were chunks of slow-roasted Iberico pork neck that was so tender, with shiitake custard, lotus seed, and pork rib broth poured in tableside. It seems strange mixing scallop and pork together and we like the interesting presentation, but perhaps it's trying to get used to the idea of putting these two ingredients together. Our main course was red sea bream with steamed razor clam, Japanese mukago yam, pomelo and shio kombu butter. It was disappointing the sea bream was a tad overcooked, but otherwise enjoyed the flavours of this dish, sweet and savoury along with the colours in the shallow bowl. Finally for dessert, Amazake milk mousse with Japanese nashi pear, shiso leaf granita and a scoop of pear ice cream. Loved the shiso leaf granita! It was so refreshing and went well with the crunchy pear balls, but the milk mousse was too much cream for my taste. 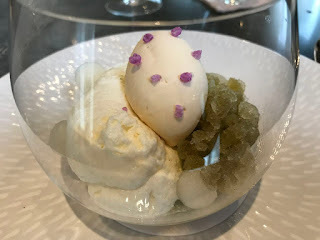 Milk mousse (left) with shiso leaf granita and pear ice cream! Redemption in the form of petite fours -- small strawberry lamingtons that had a cold strawberry middle, and the other was a gourmet bite that tasted like a snickers bar -- chocolate, peanut butter and a bit of caramel. Our bill came to S$95 or HK$548 (US$70) each. We look forward to better things from the talented chef Sam!